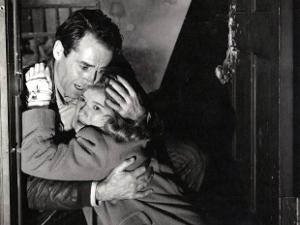 Henry Fonda barricades himself inside his motel room after murdering a fiendish magician played by Vincent Price. While the police and a impassioned Barbara Bel Geddes try to coax him out, the movie cuts back and forth to events leading up to the siege. The Long Night features some fancy outdoor sets and occassionally gorgeous cinematography, as well as some enjoyable performances from Fonda and Price — the iconic kind for which they would become best known. Dimitri Tiomkin incorporates Beethoven’s 2nd Symphony for a wonderfully moody score. It almost adds up to a nice, twisted little noir movie. But the whole affair is covered in clunky, useless narration and inner monologues, and the ending is a tad overwrought.